This photo was taken on June 4, 2013 at 11:21 AM. The location was at my favorite pond in Fairview, Virginia. The "Take it!" came after having taken several photos of the surroundings of the pond. 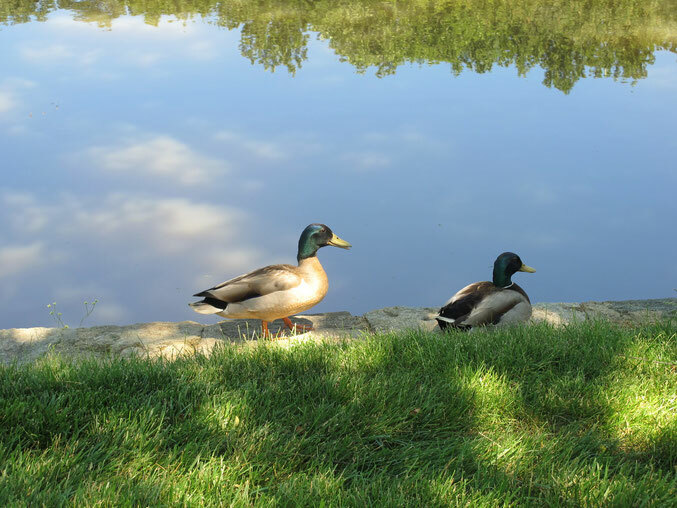 I came across the resident Mallard Duck couple that I have seen there for several years. They are quite tame - and do not pay much attention to people and what they do. I took several shots of them with the female standing and the male still sitting or whatever you call it when they are down - lol. As luck would have it - she stepped forward into one of the shafts of sunlight that was coming through the overhead tree. The way the light plays on her forward part of her body is simply grand. Another part to the title has to do with the difference in coloring between the female and the male. He has lots of color which they say is to attract a female - while she is more muted in order to be able to blend in with grasses etc and protect her nest and or young. Thus - with the cooperation of the sun - she is truly shining. One could say - he has it made in the shade - lol. When taking photos - I often am concentrating on the central subject and the attempt to get that part of the photo be "just right" - or as right as I possibly can. In engaging in this sort of focusing I sometimes do not even see what is surrounding the subject and am left to find out about that when I later view the whole picture. In this shot - I am so fortunate that the angle of my focus captured the reflection of the sky in the water of the pond. The blue of the sky is a knock out. The little puffs of clouds that seem to rise up off of her back just add a bit of emphasis to her in this moment. Having the reflection of some trees from the opposite shore - is also a nice part of the gift of the whole photo. The After Take: This is one of those shots that brings instant admiration from the viewer. There has not been anyone that has not been favorably taken with this photo. I quickly let them know - the chance of getting this shot was truly a gift, and one I am very fortunate to be able to share. Here is hoping you enjoy this photo as much as I have. Nature is full of gifts. Women, always getting the limelight. I showed this to some of the teachers at the school I teach. The biology teacher said that male birds tend to be more flamboyant than females because they usually need to impress the female into picking them. He said he wasn't sure if that was the case with ducks. Personally I think their shine is very pretty. Every time I see photo's of this pond I just think how much I'd love to take a dive in it. Lol Jim! They are the beautiful ones. Almost looks like the duck is talking to the other one. "Get outta the way!"